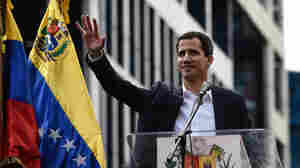 March 21, 2019  Colombia says about 1,000 Venezuelan soldiers have defected and back opposition leader Juan Guaido. 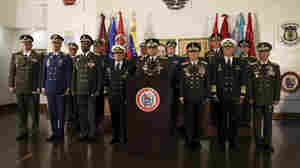 The defections have done little to undermine the military's support for Nicolas Maduro. March 12, 2019  Venezuela's authoritarian leader has closed the border with Colombia to frustrate opposition efforts to bring in humanitarian aid. But that hasn't stopped Venezuelans from crossing the border for aid. February 24, 2019  Colombia closed its bridges into Venezuela a day after attempts to get relief supplies across the border ended in violence. Vice President Mike Pence meets with Venezuela's opposition leader Monday. 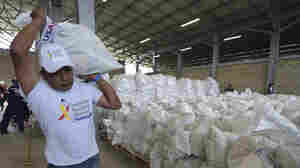 February 24, 2019  We have an update on the situation in Venezuela, one day after volunteers tried to force their way into the country with U.S. food aid. February 23, 2019  Violence broke out at the border between Venezuela and Colombia. Venezuelan troops fired tear gas and stopped crowds trying to bring humanitarian aid across the border. February 23, 2019  Venezuela's president is refusing to allow tons of U.S. humanitarian aid to enter the country. But thousands of volunteers are trying to bring it in from Colombia. February 22, 2019  Thousands are gathered in a Colombian border town for a star-studded concert on the eve of a showdown over getting U.S. food aid into neighboring Venezuela. February 11, 2019  U.S. food and medical aid for Venezuelans is sitting at the border, unable to move into the country because embattled President Nicolás Maduro has blocked the roads. February 11, 2019  The Venezuela military is blocking humanitarian aid from getting into the country, where political and economic crisis rage on. The U.S.-backed interim president has vowed to open those aid routes. January 31, 2019  The U.S. government and Venezuela's self-proclaimed interim president are calling on the military to withdraw support for Maduro's government. But fomenting a coup could bring unexpected consequences. January 29, 2019  Venezuela sits atop the world's largest oil reserves and is largely dependent on cash it earns through exports. The sanctions deny authoritarian President Nicolás Maduro the cash paid for the fuel.